Leaf spot and melting-out diseases are incited by a group of fungi in the genera Bipolaris, Drechslera, and Exserohilum. These fungi used to be referred to as Helminthosporium and many individuals still use this name for convenience. Every cool-season grass species probably has a leaf spot/melting-out disease associated with it, but Kentucky bluegrass is particularly susceptible. These organisms, under pasture and native grassland conditions, cause leaf spots of little consequence. However, as cutting height is reduced and the nitrogen level increased, leaf spot diseases may become so severe that complete loss of the turf can occur. The causal fungi usually first invade the leaves, producing small brown spots. As the disease worsens, the spots on leaf blades expand and produce a dark purplish-red oval border around a tan center. The spots enlarge until the entire width of the leaf blade is blighted. 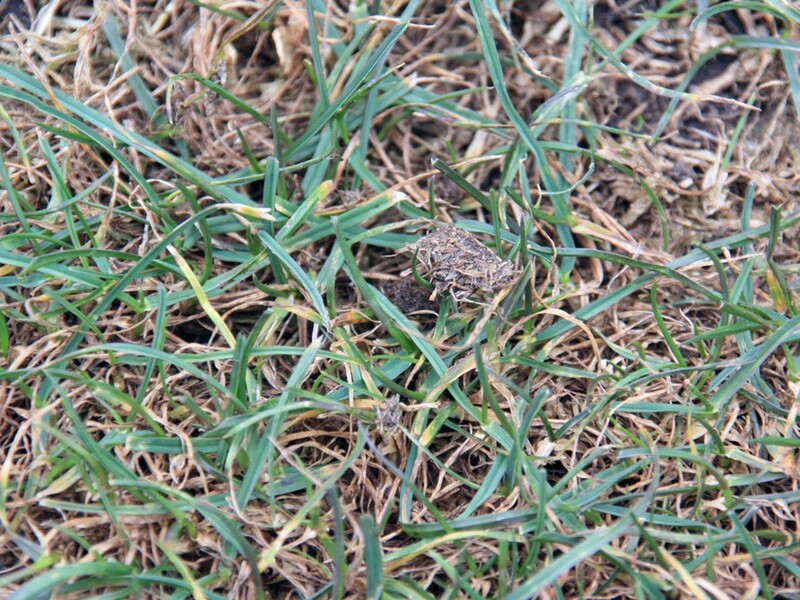 The leaf-spotting or leaf-blighting phase is less damaging to the turfgrass than is the melting-out (crown and root-rot) phase of the diseases. In melting-out, the crowns and roots are damaged, causing severe thinning of the turf. This disease cycle outlines the most problematic leaf spot disease, spring leaf spot/melting-out of Kentucky bluegrasses. The causal fungus survives the winter in crowns and roots of turfgrass or on turf debris on or in the soil. The fungus becomes active during the cool, wet weather of spring. Spores are produced by the causal fungus on leaves and are released and splashed by rain or irrigation water to newly-emerging grass leaves, causing new leaf spots. Successive generations of spores and leaf spots are produced during mid- to late-spring. Spores wash to the crown and root areas, inciting the melting-out phase of the disease usually by late spring or early summer. Keep in mind that not all leaf spot diseases are spring problems. 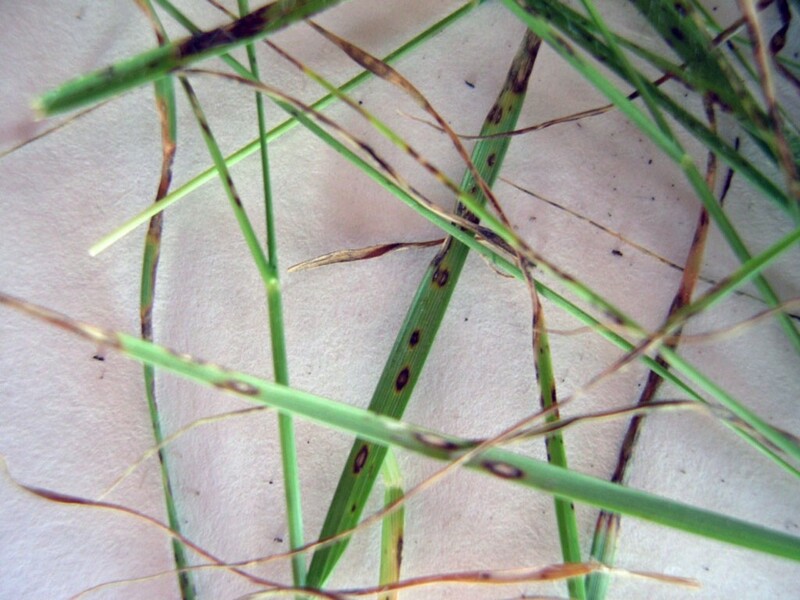 During summer, leaf spotting fungi can attack nearly every grass species. Certain varieties of Kentucky bluegrass, perennial ryegrass, bentgrasses, tall fescue, and fine fescues are susceptible. It is very difficult to predict when the symptoms will be most severe. In most Kentucky bluegrass turfs, however, mid- to late-spring is the time of greatest activity and damage. Applying excessive nitrogen in early spring usually will make leaf spot and melting-out diseases more severe. These diseases can also be severe under nitrogen deficiencies. The lush, dark green, fast growing lawn in early-spring is the kind of condition that encourages the disease in May. Probably the most important factor in controlling spring leaf spot and melting-out diseases is not to apply excessive nitrogen fertilizer (more than 500g nitrogen/100m²) in early spring. A nitrogen application in the range of 200-400g nitrogen/100m² in early spring is a reasonable amount of fertilizer to apply for most Kentucky bluegrass lawns. Possibly the best nonchemical method for controlling leaf spot and melting-out diseases is to replant damaged and disease-prone areas with resistant varieties. Fungicides effectively control leaf spot and melting-out diseases, but correct application and timing are critical. An effective fungicide program requires that the first application be made in early April when the grass begins to green and that applications be repeated during late April and early May, usually at two-week intervals. Fungicides applied at the melting-out stage, when the damage is readily apparent, usually produce little improvement. Recovery of the turf at this stage becomes a matter of encouraging regrowth of the thinned turf. 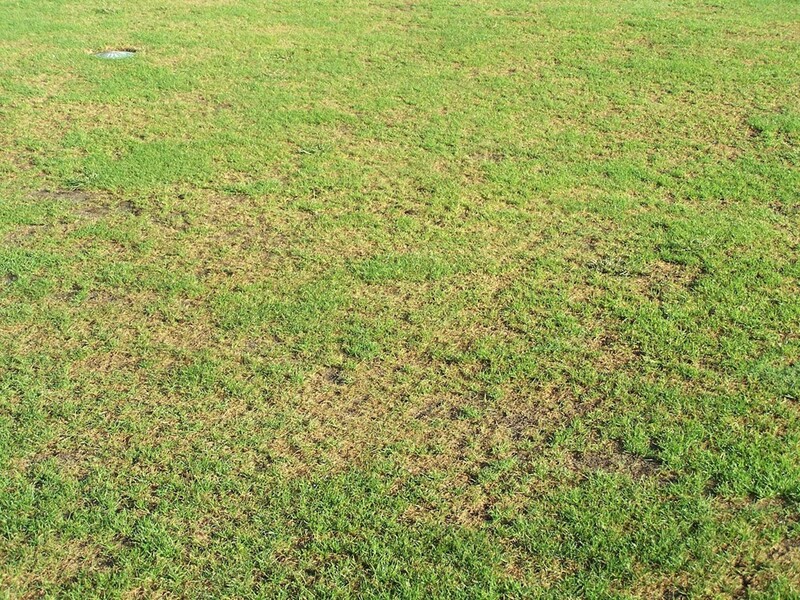 If plant loss is severe, overseeding is required. For the summer leaf spot diseases, fungicide applications should begin as soon as the first leaf spots appear.